Are you looking for an EASY button? A “quick fix”? A magic solution? You get to choose which of these components of the Dan Abraham Healthy Living Center works best for you on a given day. Seasons change - one month, you may need more 'boot camp' style trainers and workouts. Another month, the partnership of a wellness coach may be what fits your needs. Does a drop-in fitness class fit your schedule better this week? Or maybe you could use the accountability and structure of a weekly small-group training. Does a fresh perspective on meal preparation spark your interest? Perhaps you enjoy reading and would like to investigate the Active Book Club options. Your best bet? Try something. Do something. Guess what? Even if it isn't a best fit, at least you gave it a shot. Now you can explore another option! Talk to a trainer. Ask a group fitness instructor. Meet with a coach. Question the member service representatives - what have they tried that has worked well for them? Freshen up your cooking with a dietitian and executive chef. 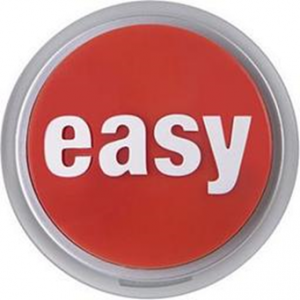 The 'easy' button may be taking one step in the direction you want to explore. Enjoy the process!